What is Google Groups for Business Collaborative Inbox? Google Groups is best known as an Internet message board, however what isn't so widely known is that Google Groups is also capable of being a shared support inbox, allowing you and your colleagues to manage customer questions and issues as a team. Your customers (or leads, or suppliers, etc) can email your support email address and you can view, manage and respond to their questions. Think of your Collaborative Inbox as a kind of turbo-changed version of the regular Gmail inbox: customer emails are grouped by subject and you and your team can reply to queries, assign support issues to other team members, categorize and manage emails. There are also a number of other help-desk type features such as marking queries as complete, filtering isses and so on. This article will guide you through the major steps involved in setting up a company shared inbox. To begin, head on over to Google Groups, and sign in with your G Suite login (you will need to be a company admin or have delegated permissions to create a group). Click to create a new group, give your group a name and an email address and select the group type as 'Collaborative Inbox'. Go ahead and create the group. You also want your customers to be able to email in their queries and issues, so click the link to "manage" your group and navigate to "Information" > "General Information" and check to "Allow posting by email"
Your group is now created, test it is working as you expect by sending an email to your group address from an email outside of your organization. The email should show as a topic in your group shared inbox. If you haven't done this already, now is a good time to set up email authentication for your domain. This is important as without email authentication set up your replies risk going to your customers' spam folder. Email authentication or Domain Keys Identified Mail (DKIM) is a process whereby you prove that you own the domain name you are sending email from. An automatic, or canned response lets the person contacting your support desk know that you have received their enquiry. 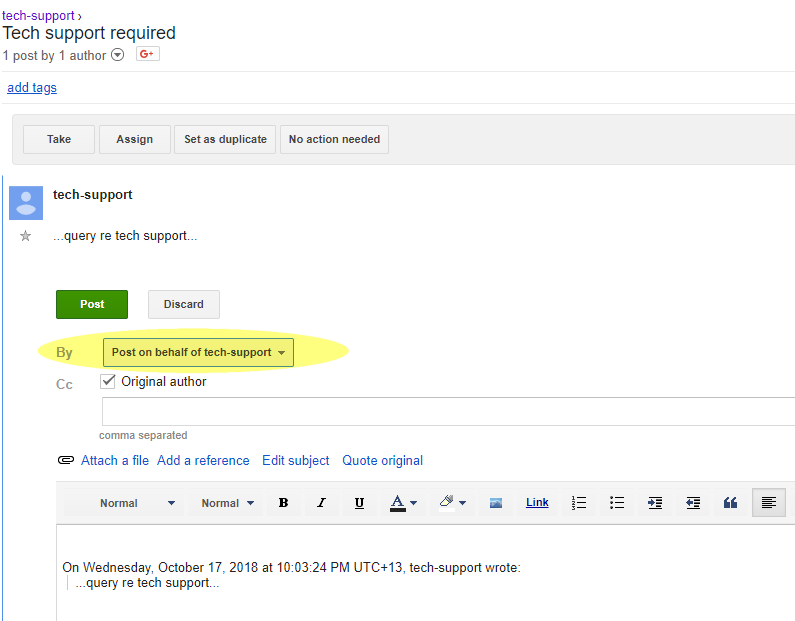 To set up a canned response in Google Groups, navigate to "Settings" > "Email options". To enable the auto-email for people emailing your support address, check the option "Enable auto-reply message for non members outside the organization", and enter the text you would like your customers to receive. When a new message arrives you and all members of your group will receive a copy of the email in their Gmail inbox (you can control who receives notification and with what frequency). This is a handy feature as it allows you and your team to be alerted promptly of customer emails without having to continually monitor the shared inbox. You can reply to these emails directly, however if you do this without CC'ing in your group email then your email response will not be saved in the email thread in Google Groups. For this reason it is best to reply to queries by going first to the shared inbox. If this is not possible, for example if you are replying using Gmail on your mobile device, then remember to CC in your group support email address so there is a record of the correspondence. When you or a group team member responds to a customer email from the shared inbox you have an option to send the response from your own email, or from the group email. It is best to select to post on behalf of the group because this way replies will come to the shared inbox (where they are tracked) rather than to your personal inbox (where they won't be tracked).